Hello and welcome to the 346th installment of the SWD. Turkey-backed Free Syrian Army, backed by Turkish Air and Land Forces captured two localities from the Syrian Democratic Forces’ YPG in Afrin region, as a part of the operation ‘Olive Branch’ (AR: Ghasin al-Zaytun, TR: Zeytin Dalı). Free Syrian Army captured Balfur village in Jindires subdistrict and Maskah village in Rajo subdistrict. Syrian Democratic Forces’ YPG reportedly handed over the city of Tell Rifaat in the northern Aleppo to the Syrian Arab Army. 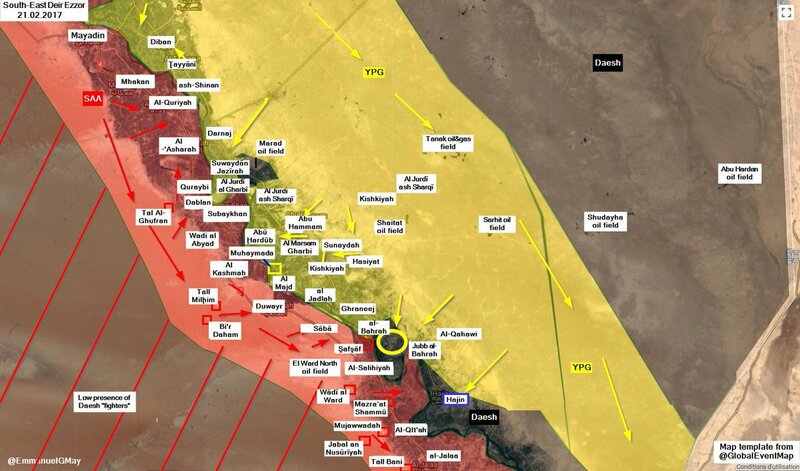 Separately, Syrian Arab Army entered YPG-held areas of Al-Hellok, Bani Zeid and Bustan al-Basha districts of Aleppo. YPG still maintains presence in Sheikh Masqoud district and parts of Ashrafiyeh district. Jabhat Tahrir Suriya (Ahrar al-Sham and Harakat Nour al-Deen al-Zenki) captured Kafr Naha in the western Aleppo from Hayat Tahrir al-Sham. Jabhat Tahrir Suriya also downed Hayat Tahrir al-Sham’s drone over Kafr Naha. After the capture of Kafr Naha, clashes started on Awijel and Urum al-Kubra fronts, as Jabhat Tahrir Suriya is attempting to advance. Hayat Tahrir al-Sham’s Ibaa News Agency reported that the group captured Bisrtoun village in the western Aleppo from Jabhat Tahrir Suriya. Jabhat Tahrir Suriya reported that Hayat Tahrir al-Sham’s BMP and two technicals were destroyed during the clashes for Bisrtoun. Hayat Tahrir al-Sham’s commander, Abu Muslim al-Tamaneh was announced as killed after yesterday’s clashes with Jabhat Tahrir Suriya in Hass (Khirbet Hass) area. Another Hayat Tahrir al-Sham’s commander, Abu Islam al-Tamaneh was wounded in the same encounter. Hayat Tahrir al-Sham’s Ibaa News Agency reported that Jabhat Tahrir Suriya’s (Harakat Nour al-Deen al-Zenki’s) commander, Muhammad al-Dali (Nouri) was arrested in Al-Dana. Al-Dali was arrested as he and his elements were reportedly preparing to launch an attack on Hayat Tahrir al-Sham’s headquarters and elements in Al-Dana. Jabhat Tahrir Suriya and Hayat Tahrir al-Sham clashed in Maaret al-Sin, Abdeen, Marayan, and Al-Fatirah. Islamic State’s Amaq Agency reported that CJTF-OIR‘s airstrikes over Al-Shaafa village killed 25 and wounded four civilians. Syrian Arab Army’s artillery, Syrian Arab Air Force, and Russian Air Force targeted Douma, Zamalka, Hammouriyah, Arbeen, Kafr Batna, Beit Sawa, Saqba, Misraba, Hazeh, and Awtaya in the East Ghouta. According to the reports, 37 civilians were reportedly killed and dozens wounded by the targeting of the aforementioned localities. Rebel forces in the East Ghouta shelled Jaraman, Harasta, and Rukn al-Deen, Barzeh, Al-Joura, Al-Qaboun, Bab Touma, Bab al-Salam, and Al-Mezzeh 86 areas of the city of Damascus. According to the Syrian Arab News Agency, a civilian was killed and 43 wounded by the shelling of the aforementioned localities. Jaysh al-Islam’s spokesman Hamza Birqdar stated that the group repelled nine Syrian Arab Army’s infiltration attempts on Hazrama front in the eastern part of the East Ghouta. Birqdar also stated that 20 elements of the Syrian Arab Army were killed and wounded in several ambushes, which occurred during the failed infiltration attempts. Jaysh al-Islam also reportedly damaged Syrian Arab Army’s BMP, which was trying to evacuate the wounded elements. Afghan National Security Forces killed 23 and arrested two elements of the Islamic Emirate of Afghanistan (Taliban), as well as destroyed a vehicle and two VBIEDs, according to the Afghan Ministry of Defense. Afghan National Security Forces also seized several weapons depots and ammunition caches. Islamic Emirate of Afghanistan overran Afghan Local Police’s checkpoint in Imam Sahib district, killing two and wounding two elements of the police in the process. One element of the Islamic Emirate of Afghanistan was killed in the encounter. Islamic Emirate of Afghanistan seized an assault rifle, a PK machine gun, and quantities of ammunition from the checkpoint. Islamic State’s sniper reportedly killed an element of the Afghan National Army in Wata Pur district. Afghan National Security Forces killed four elements of the Islamic Emirate of Afghanistan, as well as destroyed six VBIEDs and several weapons and ammunition caches in Tagab district. Islamic Emirate of Afghanistan raided Afghan National Army’s checkpoint in Khogyani district, wounding a soldier. Islamic Emirate of Afghanistan assassinated Afghan Local Police’s commander in Bihsud district. Afghan National Security Forces killed two elements of the Islamic Emirate of Afghanistan in Zurmat district. Islamic Emirate of Afghanistan’s improvised explosive device targeted Afghan National Police’s vehicle in the city of Khost, killing two and wounding two policemen. Islamic Emirate of Afghanistan’s sniper killed an element of the Afghan National Army in Nadir Shah Kot district. Afghan National Security Forces killed two Islamic Emirate of Afghanistan’s local commanders, Mullah Mohammad and Mullah Habib al-Rahman in Muqur district. Two elements of the Afghan Local Police surrendered to the Islamic Emirate of Afghanistan in Qadis district. Separately, Islamic Emirate of Afghanistan arrested an element of the Afghan Local Police at the outskirts of Jawand district. Afghan National Security Forces killed nine and wounded five elements of the Islamic Emirate of Afghanistan in Andar and Gelan districts. Islamic Emirate of Afghanistan reported that three elements of the Afghan National Security Forces were killed and two wounded during the clashes in Gelan district. Islamic Emirate of Afghanistan overran Afghan Local Police’s checkpoint in Deh Yak district, killing nine elements of the police in the process. Separately, two elements of the Afghan National Army were killed and three wounded in an attack on a checkpoint in the city of Ghazni. Islamic Emirate of Afghanistan’s improvised explosive device destroyed Afghan Local Police’s motorcycle and killed an element in Gelan district. Islamic Emirate of Afghanistan’s improvised explosive device destroyed Afghan National Army’s vehicle, killing two and wounding one soldier in Barmal district. Afghan National Security Forces killed ten and wounded four elements of the Islamic Emirate of Afghanistan in Anar Dara and Farah districts. Afghan National Security Forces killed 11 elements of the Islamic Emirate of Afghanistan, as well as destroyed a vehicle, a camp, and several weapons depots and ammunition caches in Tarinkot district. Afghan National Security Forces killed five elements of the Islamic Emirate of Afghanistan and destroyed a vehicle and several weapons depots and ammunition caches in Shamulzayi district. Afghan National Security Forces killed an element of the Islamic Emirate of Afghanistan in Jerashk district. Two Islamic Emirate of Afghanistan’s elements infiltrated Afghan National Police’s checkpoint in Bazar area of Jerashk district. According to the Islamic Emirate of Afghanistan, eight elements of the Afghan National Police, including commander Mealim were killed, while one of the two infiltrators was killed in the encounter. The second infiltrator successfully reached nearby Islamic Emirate of Afghanistan’s elements. Afghan National Army’s element surrendered to the Islamic Emirate of Afghanistan in Marjah district. Afghan National Security Forces killed seven elements of the Islamic Emirate of Afghanistan, as well as seized three motorcycles and several weapons depots and ammunition caches in Shah Wali Kot district. Between the 16th and the 22nd of February 2018 CJTF-OIR has conducted 39 strikes in Syria. CJTF-OIR‘s main focus in Syria at the moment is Deir al-Zour-Albu Kamal region where they did 39 strikes supporting SDF‘s operations against IS destroying one IS supply route, six fighting positions, three IS vehicles, an IS headquarters, an IS observation post, an IS resupply vehicle, three staging facilities, a mortar system, two motorcycles, two mortar staging facilities and three weapons caches. Islamic State’s improvised explosive device reportedly killed two elements of Ansar Allah (Houthis) in Al-Dahra area of Qaifa directorate, northwest of Al-Bayda.